Fifteen years as an accredited Powakaddy premium sales centre mean we have the expertise to offer a large range of new electric and push golf trolleys to Ayrshire and the surrounding area. We also have an in-house repair centre to fix and service Powakaddy products. 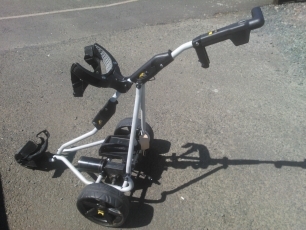 Quality pre-owned, ex rental or reconditioned Golf Trolleys and accessories are also occasionally available. Please call us on 01655 883390 for pricing and availability.